Worlds collide as EA announces that their sci-fi survival horror game Dead Space has gone gold, on target to ship to retailers across the country on October 14th. Along with the gone gold announcement, EA has also revealed two platform-specific, limited-edition downloadable outfits for the game, available to customers who purchase and play within the first two weeks of the game's release. The PlayStation 3 version is a rather snazzy black and blue affair, while the Xbox 360 version sports a dirty white and yellow motif to match the consoles' colors. Personally I hate console-specific premiums, as they generally tack an hour onto my visit at the game store, picking up one, putting it back, picking up the other, putting it back. I'm can be a pretty indecisive guy when I decide to. REDWOOD CITY, Calif.—(BUSINESS WIRE)—Electronic Arts Inc. (NASDAQ:ERTS), announced today that Dead Space™, the highly anticipated new survival horror game, has gone gold and will ship in North America on October 14 for the Xbox 360® videogame and entertainment system and PLAYSTATION®3 computer entertainment system. The PC version will ship on October 20. Dead Space will be in stores in Europe on October 24 for the Xbox 360, PLAYSTATION 3 system and the PC. Players who buy the Xbox 360 and PLAYSTATION 3 versions of the game within the first two weeks of the game’s release will have the opportunity to download a platform exclusive suit. Xbox 360 fans can download the Xbox-themed Elite Suit* on Xbox LIVE® Marketplace and PLAYSTATION 3 fans can download the PlayStation-themed Obsidian Suit* on the PLAYSTATION®Network. 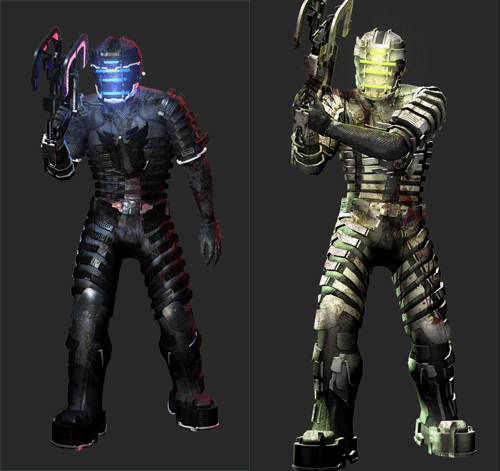 Both of these suits will feature new looks and increased toughness and inventory slots, to help players fight for survival in the Dead Space universe. In addition, for Xbox 360 owners in North America, the EA Store™ is offering a very limited run of 1000 copies of the Dead Space Ultra Limited Edition. This package contains a copy of the game, Dead Space Downfall Animated Movie on DVD, bonus content DVD, 97-page art book, the 160-page graphic novel (which combines all six issues of the Dead Space comics), exclusive lithograph illustrated and individually signed by Ben Templesmith, and an Ishimura crew patch, all sealed in a limited edition Dead Space packaging. The Dead Space Ultra Limited Edition can be ordered through the EA Store and will ship on October 14. The bold and often bloody Dead Space promises to deliver the ultimate in psychological terror and gruesome cinematic action. Set in the cold blackness of deep space, the atmosphere in Dead Space is soaked with a feeling of tension, dread and sheer terror. In Dead Space, players step into the role of mining engineer Isaac Clarke, an ordinary man on a seemingly routine mission to fix the communications systems aboard a deep space mining ship. It’s not long before Isaac awakes to a living nightmare filled with vicious genetic mutations inside a dead, claustrophobic silence. Now Isaac is cut off, trapped, and engaged in a desperate fight for survival. Under development at EA Redwood Shores, Dead Space has been rated M for Mature with descriptors of Blood and Gore, Intense Violence and Strong Language by the ESRB and 18+ for PEGI. Dead Space will be available for MSRP $59.99 on the Xbox 360 and PLAYSTATION 3 system and MSRP $49.99 for the PC. The Dead Space Ultra Limited Edition will be available on the Xbox 360 for MSRP $149.95. For more information about the game, go to the website at http://www.deadspacegame.com or http://info.ea.com.